Tribal Beaded Designer Necklace : LOVE2HAVE in the UK! We love this men's and women's tribal designer necklace being one of the few beaded necklaces we sell on this site. Beaded necklaces are usually quite popular with women, but this necklace is proving to be the exception with its colour choice and modern, contemporary selection of beads. The necklace itself is from the Raven range of jewellery featuring a little silver raven. It features lovely detail with a tribal style design. 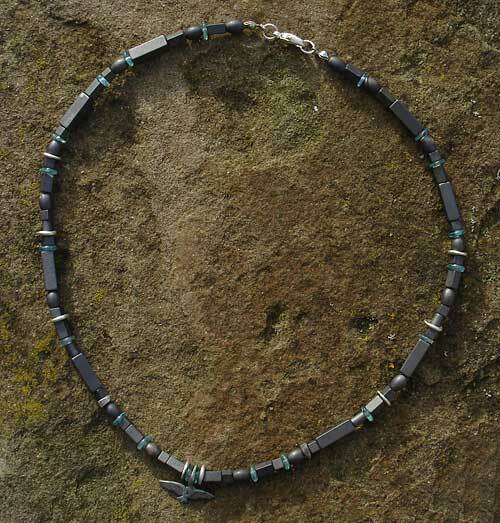 The necklace comes strung with hematite and apatite beads and with small silver triangles and silver jump rings. They come in different shapes such as squared and rounded and are threaded randomly for that authentic handmade look. This piece is an outstanding designer beaded necklace for men. The approximate length is 18 inches. 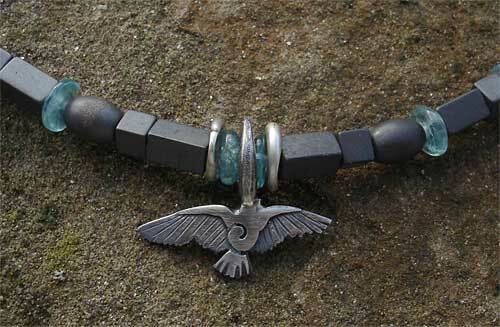 Metal(s)/Material(s) Available: 925 sterling silver,hematite and apatite.